The tiny back mudroom off this Boonton, NJ home was not in good condition. The wood portions were rotting, the paint was peeling, the railings were rusting, and the cement stairs were crumbling. So, it was time for a total overhaul. We replaced this worn back porch with a picture-perfect classic covered porch. Even better, it matches the style of the home’s front porch. Along with a whole home exterior paint job, we transformed this home in just a matter of weeks. Once the project had been drawn up and the materials had been selected by the homeowner, this project kicked off. Firstly, the carpenters started by removing the existing structure, including the removal of the concrete steps. Once the area was cleared and leveled, the new structure was started. The carpenters installed the posts and built the framework. 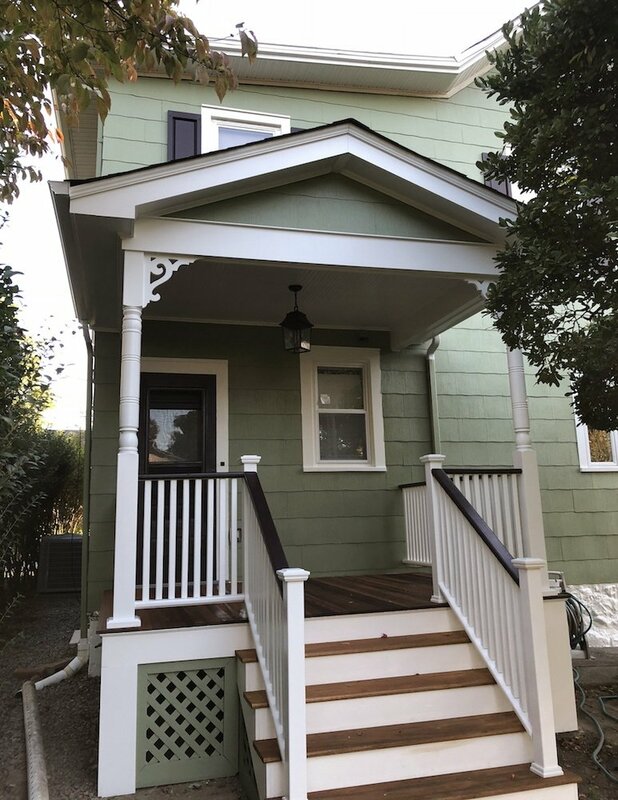 They built the covered porch from pressure-treated lumber, to match the front porch. Then the carpenters installed mahogany floorboards. They also added a beadboard ceiling, along with a new light fixture. Now the painters got to work. The home was made of asbestos shingles, so the painters carefully repainted the exterior with two coats of premium paint. The walls were painted a pretty sage green. The trim and railing system was painted a bright white. In contrast, the painters painted the handrails black to match the back door and lighting fixture. This new gorgeous classic covered porch is ready to be enjoyed.